Environmental Facts Regarding Inhibited De-Icers. A Ohio County, “recently approved a resolution supporting a $50,000 grant from county sewer user fees to the Ohio State University Extension Office for education of farmers in proper fertilizer application to reduce phosphorus in rainwater runoff from farmland. The phosphorus promotes algae growth that threatens drinking-water supplies. This summer, some 400,000 Toledo area residents couldn’t drink their tap water for two days because of algae growth in Lake Erie, which is their water source.” Quoted from “the Vindicator” news source. The interesting thing about the phosphorus in fertilizers used by farmers is, farmers run a business, they won’t apply any more then absolutely needed. It adds cost to their crops that hurts their bottom line. They also look for more environmentally friendly fertilizers as a good business practice, this helps drive the market place to provide a lower cost, more environmentally friendly product. However! This same county is now buying a competitors liquid deicer, a BEET Juice by product that has been found to be high in phosphorus!! How can you be concerned about farm runoff, but not even looking at the products applied to your local roads? With the harsh winter last year and more of the same on the way for this coming winter, I would think that as a good steward of the environment, you would be looking at what is in the products you purchase. Below is a link to the ClearRoads study that rates liquid deicers. What is the Difference Between Anti-Icing And De-Icing? This is another question that we get at GLC. Hope this helps clear things up! Anti-icing—a proactive approach—should be first in a series of strategies for each winter storm. By applying a small and strategic amount of liquid before a storm, you can prevent snow and ice from bonding to the pavement. This also gives your crews a reaction time to a storm event. It allows crews to get into the shop, load their trucks and get out to there routes prior to the lanes becoming icy causing accidents. Deicing is a reactive operation where a deicer is applied to the top of an accumulation of snow, ice, or frost that has already bonded to the pavement surface and can no longer be physically removed. Deicing costs more than anti-icing in materials, time, equipment, and environmental damage. Deicing is the “traditional” approach to winter maintenance. Anti-icing with a planned transition to De-icing during a storm event can reduce accidents, which improves service levels, as well as reducing clean up cost and the end of the storm. Can I use Calcium Chloride W/BOOST* Mixed With Salt Brine ? This was a question asked of one of our staff. The answer is “ABSOLUTLEY” and with great success. 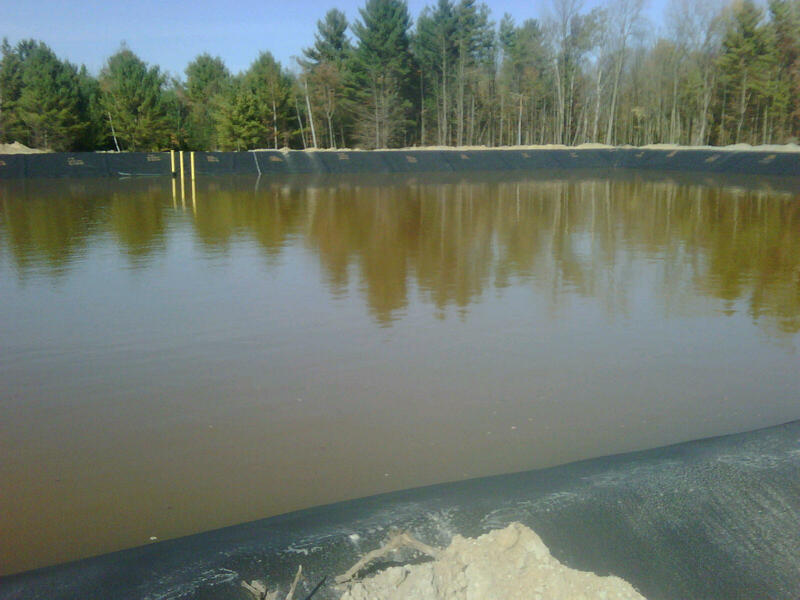 We have a number of customers in Michigan using the BOOST / Brine blend and seeing remarkable results. > Residual effect from Organic in the BOOST. > No dilution of the primary ingredient (salt) as with other Organic products. > No need for a 50/50 blend as recommended by competitors to achieve better performance. Saves Money! When mixing brine with BOOST*, check specific gravity, if higher then 1.279, recirculate through brine maker until 1.279 specific gravity is achieved. Easy to calculate @ 2 gallons of BOOST in every ten gallons of Brine. Contact Great Lakes Chloride, Inc. 269-664-6904, if you have any questions. How Does Calcium Chloride Work to Fight Snow and Ice? Calcium chloride (CaCl2) is one of nature’s uncommon wonders. It’s a specialty salt with unique properties that improve driving and pedestrian safety, remove unhealthy dust from the air we breathe, and enhance the performance of products and processes that contribute to the supply of energy, food, and other essentials of life. 1. It is hygroscopic, strongly attracting moisture from its surroundings. 2. Solid calcium chloride is deliquescent, meaning it can absorb enough moisture to convert to liquid brine. 3. When dissolved in water, solid calcium chloride releases heat in an exothermic reaction. The hygroscopic, deliquescent and exothermic properties of calcium chloride are highly beneficial in quickly melting ice on sidewalks and steps. Ice melter speed of action is determined by how easily it dissolves when exposed to snow or ice to form a brine solution. This brine lowers the freezing point of water to melt additional snow and ice on contact. By attracting moisture from its surroundings, CaCl2 speeds up the creation of brine compared to rock salt and other ice melt materials. The performance of calcium chloride is further increased because the reaction that creates CaCl2 brine actually releases heat, making calcium chloride a more effective ice melter than rock salt and most other ice melt materials that must draw heat from a cold environment to begin the melting process. How clear are the advantages of calcium chloride’s hygroscopic, deliquescent and exothermic properties? No need to take our word for it. Suppliers of rock salt blends claim that even the small amount of CaCl2 they add to their products makes a significant performance difference on icy sidewalks and steps. As flattering as those claims are, a fraction of calcium chloride won’t significantly change the performance of a bag of rock salt. It takes pure calcium chloride to melt ice faster and more thoroughly in a full winter’s range of weather conditions. Salt Prices for Upcoming 2014 – 2015 winter season. I have been hearing that salt prices would be going up this coming winter season. It looks like the increases will be hefty. The following is an excerpt from the Detroit Freepress, it confirms what I have been hearing from Landscapers, prices from $110 – $120 per ton will not be uncommon. Liquid Deicers will be the answer to those trying to beat the high cost of deicing this winter season. Calcium Chloride w/BOOST* and Liquidow 32% calcium chloride are the best liquid deicers on the market to help with your anti-icing and de-icing operations. “Late August may seem an odd time to be sweating the winter weather outlook, but it’s serious crunch time for snow removal contractors scrambling with shortages and skyrocketing prices for the one commodity critical to their livelihoods — rock salt. That’s why the first Salt Summit was convened in Detroit this week by the Snow and Ice Management Association (SIMA), the industry group for about 1,600 private snow removal contractors in the U.S. and Canada. Following the snowiest winter on record in Detroit and other northern cities, these contractors now face huge jumps in salt price quotes for the winter ahead, if they can even find suppliers willing to promise delivery of the amounts they need. “We’re hearing bulk salt prices that are in some cases double what they were a year ago,” SIMA CEO Martin Tirado told me Wednesday. From a price around $70 per ton a year ago, he said contractors are now getting quotes of $120 to $150 a ton from suppliers. Major government agencies responsible for clearing highways and main arteries are the biggest bulk salt users, buying on long-term contracts and getting priority treatment when salt supplies tighten. Mike Anderson, president of Snow and Ice Pros in Hammond, Ind., and chairman of SIMA’s board, said his suppliers are quoting prices 77% to 111% higher than last year, when he was also hit with mid-season price hikes. “We’re at the bottom of the totem pole. The salt companies have to sell to the municipalities first,” Anderson said. SIMA members are typically small- to medium-size businesses, whose customers include shopping malls and other commercial entities. Local road agencies, though not part of the Salt Summit, are also squealing about price hikes and depleted reserves. Sales prices for road commissions have jumped 46.3% this year to a statewide average of $65.71, said Denise Donohue, director of the County Road Association of Michigan, in a news release Tuesday. Some local governments could be looking at big budget hits, such as a predicted $500,000 to Washtenaw County’s 2014-15 winter expenses. “We are attempting to do more with less and the budget hits just keep on coming,” said Jim Harmon, operations director for the road commission in the county, home to Ann Arbor. The two-day Salt Summit, which sold out quickly with more than 100 SIMA members, included not only discussions of salt supplies and pricing, but also a look at various materials and application techniques contractors can use. To help with figuring how to use liquids for Parking Lots and Sidewalks, please refer to the link below. It has really good information from MnDOT and others in regards to estimating spread rates, calibrating equipment and environmental concerns. Please check out Post in my Archives that can help with Direct Liquid Applications and choosing the right liquid for your operation. It’s Time to Start Thinking About Your Winter Deicing / Anti-Icing Plan. Calcium Chloride w/BOOST Can Help. Great Lakes Chloride, Inc. (GLC) is the Midwest supplier of Calcium Chloride with BOOST™ (BOOST), a corrosion inhibited calcium chloride product listed on the Pacific Northwest Snowfighters (PNS) Qualified Products List ( www.wsdot.wa.gov/partners/pns/). To be endorsed by the PNS, a product must be submitted to their strict testing protocols. A product will only be approved by the PNS after passing those standardized tests. It should be noted that the PNS is considered the “Better Business Bureau” of deicing chemicals. Some beet juice vendors have been making claims that GLC would like to clarify. MYTH 1: Beet juice products “meet or exceed PNS specifications”. Although “meet or exceeds PNS specifications” and “on PNS Qualified Product List” sound very similar, there is a very real difference. In fact, with the exception of the PNS Experimental Category, there currently are no beet juice based products listed on the PNS Qualified Product List. MYTH 2: Beet juice products are used by state DOT’s. While there has been some limited use of beet juice products by state DOT’s in the tri-state region (Indiana, Michigan, and Ohio), beet juice products have not been approved for use on recent DOT bids which specify the product must be on the PNS Qualified Products List. All three of these states are currently using BOOST. MYTH 3: Beet juice products are environmentally safe. According to Stormwater magazine, beet juice products may have a high phosphorus level. Relatively small amounts of phosphorus can have a drastic adverse affect on aquatic ecosystems. One consequence has led to recent recommendations from lake associations that lawn fertilizer applied at lake front homes be phosphorus free. Another issue may be an increase in biological oxygen demand (BOD) from run off of beet juice products into the receiving waters. As the unrefined organic material from beet juice breaks down in a body of water, oxygen is consumed. This increase in BOD can produce low oxygen conditions in these waters. Environments most likely to be affected are pools, wetlands, and small lakes. MYTH 4: Beet juice added to liquid chloride of choice lowers corrosion. Beet juice vendors claim their corrosion test results show that when beet juice is added to sodium chloride brine corrosiveness is reduced 50% (+/-). PNS testing found the corrosion rate effectiveness of BOOST to be at a minimum 80% less corrosive than sodium chloride (rock salt). MYTH 5: Beet juice products reduce chloride use. Some beet juice product vendors make this claim on the one hand, but recommend some of the highest application rates (up to 60 gallons per lane mile) on the other hand. Combine this with their recommended blend rate of 1 part beet juice to 1 part liquid chloride (also one of the highest suggested) and you end up with up to 60 gallons of chloride per mile. Our recommended rate for BOOST application is as low as 15 gallons per lane mile. MYTH 6: Beet juice products provide monetary savings. In fact, at recently quoted prices of over $2.00 per gallon, beet juice products are more than twice the cost of BOOST. Additionally, beet juice products when mixed with sodium chloride brine have nearly 40% less active ingredient than BOOST (23% vs. 32%). When PRICE and PERFORMANCE are evaluated, BOOST is by far the better option. MYTH 7: Calcium chloride based products will soon be limited or banned from use as deicers. This could not be farther from the truth. In fact, calcium chloride has been in use for over 100 years. GLC’s calcium chloride originates from an underground ocean of natural brine beneath northwestern Michigan. It then is processed and concentrated. Calcium chloride is widely used for dust control and base stabilization. It is also used in many food products such as olives, pickles, bottled water, canned potatoes, sugar-free jelly, to name a few. Of note, it is also used as an actual component in many plant fertilizer blends. GLC previously marketed a corrosion-inhibited calcium chloride that utilized beet juice as the inhibitor. Due to problems with quality and consistency of the beet juice additive, the product was discontinued. GLC then moved on to the next generation of corrosion-inhibited calcium chloride, BOOST, a product that exhibits both high quality and consistent performance. We hope this allows you to better evaluate the liquid products that you use to battle ice and snow. It is GLC’s intention to offer you one of the best liquid deicers on the market today, BOOST, (http://www.glchloride.com) at a competitive price. Originally Posted on April 30, 2011 . I just found out Township Official was told he was buying 38% calcium chloride. Problem is it isn’t lasting but a week or so after application, can’t be Liquidow 38%. Time to do some investigating!!! It did get me thinking about the old adage, Buyer Beware! Below is an article I wrote 3 years ago that still holds true. It best to follow a good Quality Control Program to insure that everyone you deal with is playing by the rules. Even if you require laboratory test results at the time of the bid opening, don’t be afraid to take samples at the time of application. Once folks know you are checking, it keeps everyone honest. We at GLC welcome testing and will be happy to provide customers with samples during an application in their area.